Taxes are one of the few certainties in life. But even when you think you’ve met your tax obligations, you may find yourself answering questions in an audit or you may face collections because you don’t have the big amount that you’re surprised to owe at the end of the year. You need a skilled and experienced federal tax lawyer to defend your rights and to help you understand the laws. The attorneys at Silver Law PLC help federal clients in Las Vegas, including individuals and businesses of all types and sizes. Our attorneys have more than 80 years of experience among them, and they have all worked as prosecutors for the Internal Revenue Service. They have the training and experience to create a strong defense of your legal rights. Our Las Vegas federal tax lawyers represent clients involved in both civil and criminal litigation, and we represent individuals as well as businesses of all types and sizes. Our attorneys have years of experience litigating, and they represent clients in the court room, on appeal, and through mediation. Some audits can be as simple as the IRS sending you a letter and asking for more information. Others are complex and require that you provide extension documentation and go over your return line by line. No matter what type of audit you are facing, you a tax lawyer can guide you through it so that you don’t say or do anything that could cause you to owe more or to land in legal trouble. Your attorney will work to reduce your liability and to your tax debt, either through finding additional taxes and deductions or by negotiating a settlement on your behalf. During an audit or a cursory review of your return, the IRS may find wrongdoing on the part of your spouse, such as failing to report certain assets or committing some type of fraud. Because you are married, you can be held equally responsible, even if you did not know about what was happening. The only way to avoid punishment is to work with your Las Vegas federal tax lawyer to get innocent spouse relief. Your attorney will help you put together a strong application with the right documentation and argument to show that you should not be held accountable. Getting innocent spouse relief can be a tricky process, so you must work with an experienced attorney to get results. Our Nevada federal tax lawyers can help. You wound up on the wrong side of the audit, your appeal for innocent spouse relief was rejected, or you just didn’t have the money to pay your tax bill at the end of the year. Now you are looking at a massive debt that has been turned over to collections, and you face the threat of having your property seized or your wages garnished. A Las Vegas federal tax lawyer from our team can help you deal with these collection efforts, potentially by negotiating a settlement on your behalf that reduces your debt or by working out a payment plan that you can afford. Having a business, investments, or accounts overseas comes with special tax reporting requirements. You do have to declare these assets, even if they are held overseas. You can take advantage of the offshore voluntary disclosure initiative to report past earnings or assets that you didn’t report before, and you can work with your federal tax lawyer to understand how to report your current assets. Failing to make these disclosures can result in serious penalties, so it is important that you work with your federal tax lawyer to report everything while also finding ways to minimize your tax liability. Helped With My IRS Audit! Silver Law PLC is committed to helping you protect your rights and to reduce your liability. Contact us today in Nevada to learn more about our federal tax law services or to talk about the specifics of your case with a trusted federal tax lawyer. Our attorneys have years of experience helping people just like you and businesses just like yours, and they are ready to help you get results. When the tax man comes calling, you can’t just run and hide. You have to confront your legal responsibilities head on, or you risk compounding the problem with steep fines and penalties, which can include jail time. Even if you believe that you don’t owe taxes or that the IRS has made a mistake, you must deal with these issues directly. 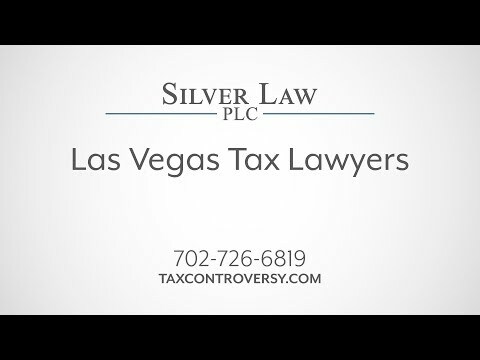 The North Las Vegas federal tax lawyers at Silver Law PLC are here to help you. Whether you just need representation during a simple tax audit or you need a federal tax litigation lawyer to represent you in a criminal case, our experienced attorneys are ready to fight for you every step of the way and make sure that your legal rights are protected. Our federal attorneys represent clients at every stage of the litigation process. We guide clients through the audit process, help them apply for innocent spouse relief, counsel them on foreign tax reporting requirements, and more. With more than eight decades of combined experience, our attorneys have the knowledge and skill to help you resolve your tax issues while minimizing liability. Call our firm today to speak with a North Las Vegas federal tax attorney and learn more about how we can help you. Perhaps no other area of the law is more complicated than the tax code. If you have an issue with the IRS, the stakes are too high to try to handle it yourself. You need to work with an experienced Henderson federal tax lawyer who can help you understand how the laws apply to your case and what your legal options are for resolving your issues. The federal tax lawyers at Silver Law PLC are tax experts, and they are ready to fight for the residents of Henderson. Our attorneys have all worked as prosecutors for the IRS, so they have a unique insight into how these cases are pursued. They will use those insights to fight for your rights and to minimize your liability. Call our firm if you need federal tax audit representation, if you are facing tax collections, if you have questions about foreign tax reporting requirements, if you need to file for innocent spouse relief, or if you are a party to tax litigation. A federal tax law professional from our team will provide guidance or representation to protect your interests and help you avoid penalty. Paradise residents have come to know and trust the federal tax law experts at Silver Law PLC for their experience and expertise in all types of tax matters. Every federal tax lawyer on our team has worked as an IRS lawyer at one point, litigating cases on behalf of the federal government. Now, those same attorneys use that knowledge and experience to fight for the citizens of Paradise and help them minimize financial liability and avoid criminal penalties. Our lawyers have more than 80 years of combined experience, and they are ready to use that experience to fight for you. From tax audits to litigation, we help you with it all. If you have been notified that you will be audited, call to talk with a tax audit lawyer about representation to ensure that you have the proper legal guidance during the process. You may be able to file for innocent spouse relief, or your attorney may be able to counsel you on foreign tax reporting, if those issues apply. Our attorneys also help those facing tax collections, working to get them an affordable payment plan or settlement. Call us today to learn more. The Spring Valley federal tax lawyers at Silver Law PLC are ready to help you with your tax issue, fighting to protect your interests and help you to avoid liability. Our attorneys are experts in tax law, and they have 80 years of combined experience to put to work for you. In fact, all of our attorneys have also worked as IRS lawyers, so they know how to litigate these cases from both sides of the aisle. They use that knowledge to fight for the outcome you need. But you don’t have to be going to court to need a federal tax attorney. We can help you if you’re in need of a tax audit lawyer, need to fight collection efforts, have questions about foreign tax reporting obligations, or need to file for innocent spouse relief. We fight on behalf of individuals and businesses of all sizes. Call us in Spring Valley to learn more about how we can help you. Violations of federal tax law can result in serious fines and penalties, including liens against your property and even jail time. Even if you feel that you have not violated the law, you may have done so unknowingly, and what you don’t know can hurt you. If you have a case open with the IRS, you need to be working with a Sunrise Manor federal tax lawyer who can guide you through the case and fight to protect your rights, ensuring that you meet your responsibilities and don’t take any missteps that can lead to penalties. Silver Law PLC represents individuals and businesses in Sunrise for everything from simple federal tax audits up to complex federal criminal tax litigation. We can help you understand what to do, what to say, and what documentation to provide to support your case and protect your rights. We’ll fight to have your penalties minimized or to have your tax debt eradicated. Call us in Sunrise today to talk with a federal tax law professional and learn more about your legal options. Don’t try to represent yourself in these complex matters where the stakes are high. The IRS is a huge operation within the federal government with thousands of people working on its behalf. It has analysts and attorneys who will scrutinize your finances and use every tool the law provides to collect what you are believed to owe and prosecute you for any believed wrongdoing. You need an experienced and dedicated federal tax law lawyer on your side who will be working just as hard to defend your interests and make the case against the IRS’ claims. The attorneys at Silver Law PLC are ready to help you. Our attorneys have all worked as IRS lawyers in the past, so they know how these cases are prosecuted, and they use that knowledge to build the strongest defense for you. Our attorneys also represent clients in all kinds of tax audits and collections’ cases to try to ensure that they never make it to the litigation stage. Our attorneys will help you take all the credits, deductions, and other options available to lower your tax liability, and they will negotiate a settlement or payment plan when the debt cannot be eliminated. Call us today to talk with an Enterprise NV federal tax law lawyer and to learn more about your legal options. Silver Law PLC fights for Winchester residents and businesses of all sizes, helping them to protect their legal rights and minimize their tax liability. The attorneys on our team have been fighting for tax payers for more than 80 combined years, and they have worked on both sides of the aisle, defending clients in private practice and formerly prosecuting them as lawyers for the IRS. That diversity of experience gives them insights that allows them to build the strongest cases for our clients. The attorneys at Silver Law PLC provide federal audit representation, help with tax collections, guidance on foreign tax reporting obligations, assistance with filing for innocent spouse relief, and representation in tax litigation. Whether you need a tax audit lawyer or a tax litigation lawyer, Silver Law PLC can help you. Call us in Winchester today to speak with an attorney about the details of your case and to learn more about how we can help. Our dedicated attorneys are committed to getting results, whether that means having your federal tax obligation dismissed or getting your penalties reduced. The stakes are high when you are dealing with a tax matter. You could be found to owe much more tax than you thought, which can also come with all kinds of fines and interest that compound your debt. Or you could be found guilty of criminal wrongdoing, which can land you in prison. Even if you have received notification that you are going to have a simple audit, it is important that you work with an experienced federal tax lawyer who is committed to defending your interests. Silver Law PLC is ready to help. Our Boulder City federal tax law lawyers have been fighting for tax payers just like you for more than 80 years, and they have all worked as prosecutors for the IRS at one time, giving them special insights into how to defend your case. Our attorneys can provide guidance and counsel on audits, foreign tax reporting obligations, innocent spouse relief, and more. They can also provide representation in tax litigation and collections matters, helping to negotiate a settlement or to dismiss the charges against you. Call Silver Law PLC today to talk with a Boulder City IRS lawyer who is committed to helping you protect your rights. You don’t need to be involved in a complex tax litigation matter to need a federal tax lawyer. Having a dedicated attorney on your side can help you protect your rights whether you are navigating a tax audit, trying to deal with a tax collections case, or figuring out your foreign tax reporting obligation. The attorneys at Silver Law PLC in Summerlin can help you with these and many other federal tax matters. our attorneys are committed to helping you understand your legal rights and responsibilities so that you do not face legal consequences. The team at Silver Law PLC has more than 80 years of combined experience, including time spent prosecuting cases for the IRS. Our attorneys use that experience and insight to create the strongest case on your behalf, using every legal option to minimize your liability and help you avoid penalty. Our attorneys may be able to negotiate a settlement on your behalf or defend your case in court. Or they may give you the guidance needed to avoid having the case reach this point in the first place. Call our firm today to talk with a federal tax lawyer in Summerlin and to learn more about the legal options for your case.